The 21 year old Ferrari driving Charles Leclerc ran about as perfect a race as one can expect. Aside from a poor start that saw him swallowed up by teammate Sebastian Vettel and Mercedes’ Lewis Hamilton, Chuck put in a top notch race to not only re-pass Hamilton, but also catch and quickly pass Vettel in short order. He had the measure of the field, undoubtedly, stretching out a huge gap at the lead. Even as Vettel melted down on tire strategy, first getting passed for position spinning on a well worn set after a tussle for position with Hamilton. He wasn’t tipped into the spin, he just applied too much power for the rear tires to handle, looping the car around on lap 38, handing Hamilton second place. Vettel, on his way back to the pits for fresh tires completely vibrated his front wing off with the freshly-installed flat spots. On one of Bahrain’s many straights, the car simply ejected the wing and Vettel ran straight over the top of it. He needed tires anyway, may as well add a wing to that pit stop list. He re-joined in eighth. That must have been a mega bummer for the guy that was leading the race into turn one. In the meantime, up at the front, Leclerc pitted and returned in the lead, setting the fastest lap of the race on fresh tires. Even after the pit stop, Leclerc’s lead back to second, now Hamilton, sat above 10 seconds. In any other universe, this would have been a safe cruise to the finish and the win. Leclerc on the radio to his Ferrari pit wall, “There’s something strange with the engine.” Then, a few seconds later the message was repeated with an even higher sense of urgency. That lap, he lost 1.7 seconds to Hamilton behind. A couple of laps later, Charles sickly says, “What’s happening?” It’s clear he’s desperate for an answer, a simple switch he can flip to make the problems go away. “We have no H recovery.” The hybrid system is not regenerating energy, and he’s lost that 160 horsepower electric thrust. Hamilton, and then a few laps later Valtteri Bottas, makes it by the stricken Ferrari. Leclerc’s world has come crashing down. A certain victory destroyed by a failing hybrid system. He was in danger of losing the podium to a closing Max Verstappen, but both Renaults suffered a failure at the exact same time on the exact same corner, coasting to a stop at turn 2, calling out a safety car to retrieve them. The Mercedes team come home 1-2, in reverse order from the season opener. Leclerc comes home in third, netting his first Formula One podium. Vettel recovered to fifth by the flag. It must be said that Lando Norris managed to score some seriously good points with his McLaren, coming home in sixth. He won the Bahrain round in F2 last year. He must really like this track, or something. 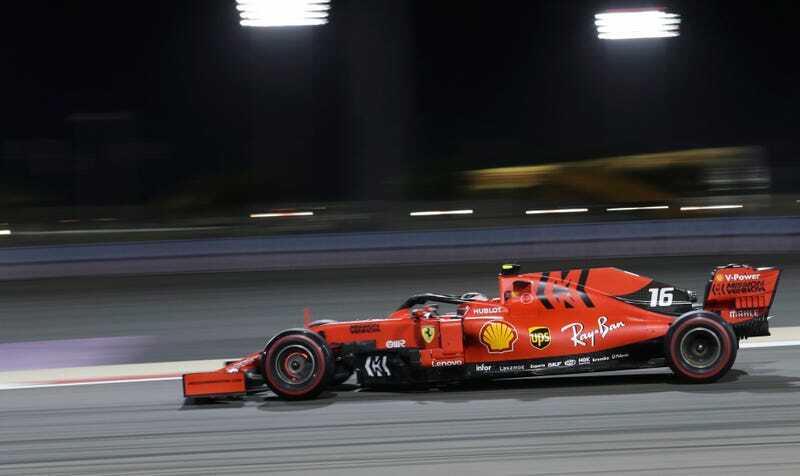 While I had an unfavorable view of the Australian Grand Prix, Bahrain delivered some interesting action at the cost of a young future champion’s first victory. The first corner was interesting, and the final finishing order was a surprise, but maybe for the wrong reasons? Credit where it is due, Lewis Hamilton has grown into an absolute class act. This was a good move by the reigning champion. Hamilton now trails Bottas by a single point, which he got as a result of the fastest lap in Australia. Verstappen sits in third, one point ahead of Leclerc. Jalopnik favorite fun-guy Daniel Ricciardo is starting the season with zero points from a pair of Renault retirements.